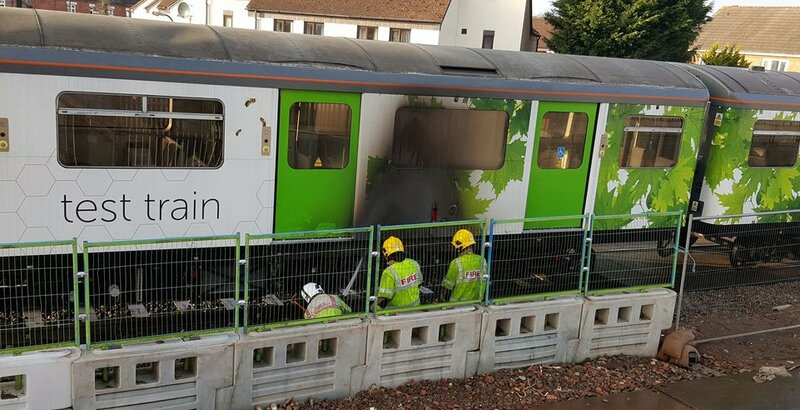 The trial of Vivarail’s innovative D-train on the Coventry to Nuneaton (NUCKLE) line has been postponed, as the firm’s test train caught fire over the festive season. On 30 December 2016 ten members of Vivarail staff were forced to evacuate from the three-car Class 230 passenger train near Kenilworth station after its engine set on fire during a test run. The fire disrupted services as it caused trains to be cancelled between Coventry and Leamington Spa and affected services from Manchester to Bournemouth. “Whilst undertaking a test run today a fire started in one of the detachable engine modules on one of the power cars. There were no passengers on the train and Vivarail staff were able to get off the train without a problem,” a Vivarail statement confirmed last week. Following last week’s incident, Vivarail’s spokesperson confirmed that the train was moved to the engine depot at Tyseley and that the planned trial of the train on the NUCKLE line will be postponed until further notice. Coventry City Council, Coventry and Warwickshire Local Enterprise Partnership, London Midland, Warwickshire County Council and the West Midlands Combined Authority (WMCA) have now jointly announced that they will no longer be able to support the project. A WMCA spokesperson told RTM that the issue was one of timing. The fire investigation means that Vivarail will not be able to begin the eight-month trial of the Class 230 in February as planned, the last date possible before a new operator takes over the West Midlands franchise in October. “There’s no way that they can get the trial up and running by the end of February,” the spokesperson said. “We’ve got no choice but to stop it.” However, they added that WMCA could still be interested in the D-Train “going forward”. The D-train uses the bodyshells, bogies and motors from surplus London Underground District Line trains. The bodyshells are made from corrosion-free aluminium, and are re-engineered to give additional collision protection. The “flexible frame” bogies – which are specifically designed for lower-quality track – are barely 10 years’ old. The existing electric motors – which are amongst the most reliable on the Underground – are powered by new underfloor-mounted low-emission diesel engines, equipped with the latest automotive “stop-start” technology. Modern electronics have replaced the existing heavy and maintenance-hungry electro-mechanical control equipment. A high power to weight ratio and purpose-designed control characteristics combine to give a high rate of acceleration, making D-trains ideal for routes with frequent station stops. D-trains can be supplied as 2-, 3- or 4-car units. They can be fitted with all the signalling interface systems needed for operation on Network Rail, and will have all relevant approvals and certification in place.